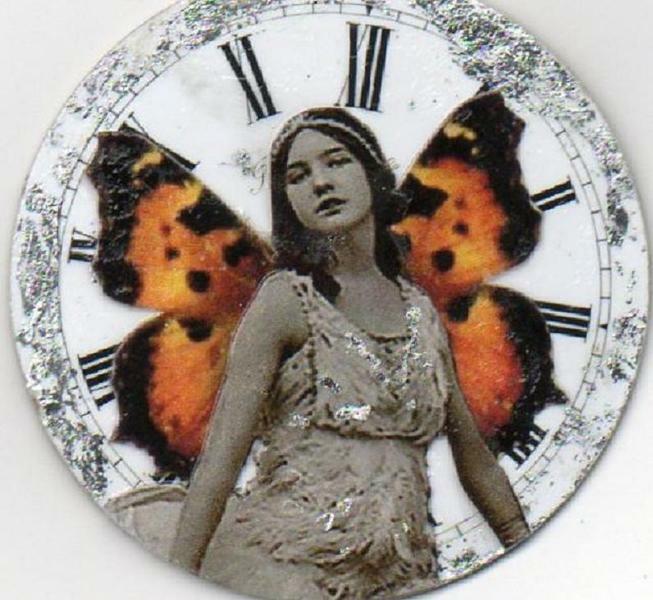 To do my bit for the environment I have recycled real watch faces to use as the base of this brooch.The front as inspired by the story of the Cottingley fairies which was the best known ethereal export to come out of the 1900's, even Sir Arther Conan Doyle was a believer.I have mixed a picture of a young ballerina with butterfly wings to give the fairy feel.I added modern decoration by using flecks of silver foil which really catches the light. The back has been covered in a velvety paper and a 1"silver plated pin as been added. Even if this piece say it's been sold please contact me to see if another can be made.